10,000 Waves has provided thousands of satisfied customers with fun, exciting and unforgettable river experiences since 1990. 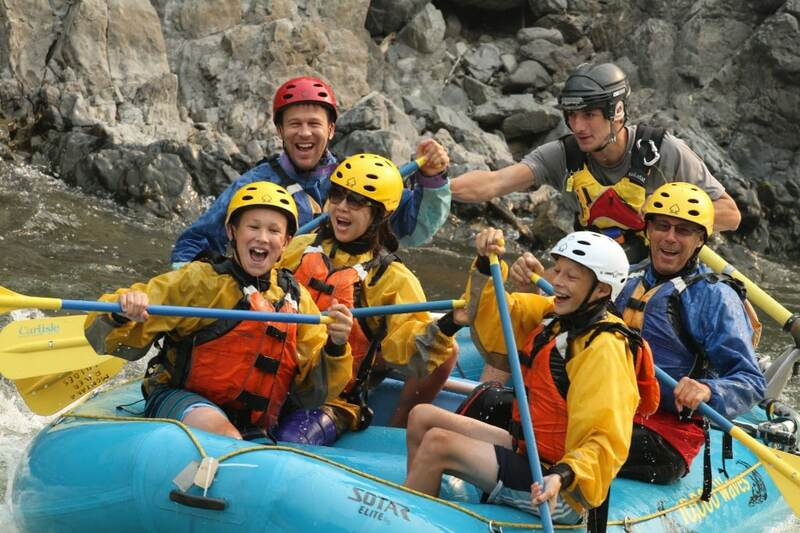 Join 10,000 Waves for Missoula white water rafting and scenic float trips at their best. 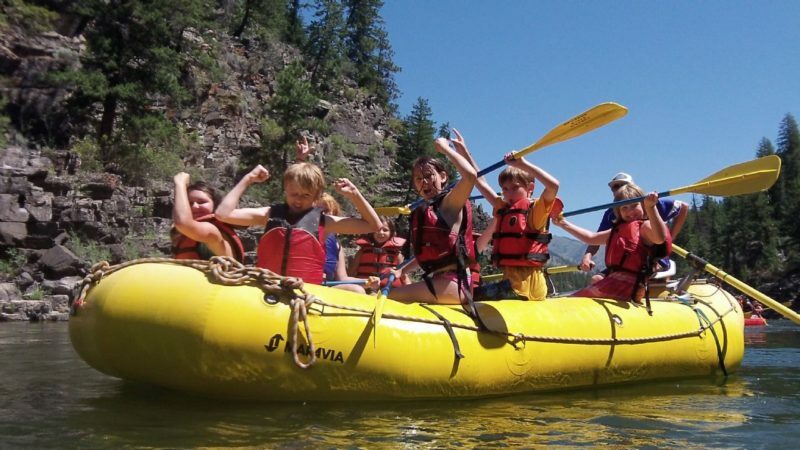 We offer a variety of the best Montana river rafting has to offer, from a half-day scenic float to a full day of whitewater rafting near Missoula. We specialize in beautiful scenic river rafting trips on the Blackfoot River and whitewater adventures on the Alberton Gorge section of the Clark Fork River in the beautiful area of Missoula, Montana. Whether you are headed to Glacier National Park, Flathead Lake or Yellowstone National Park, Missoula is the “Hub” that connects them all and hosts Montana’s premier white water rafting and kayaking. Missoula is within a three-hour drive of Spokane, Washington, and Coeur d’ Alene, Idaho. Hurry, spots fill up fast! 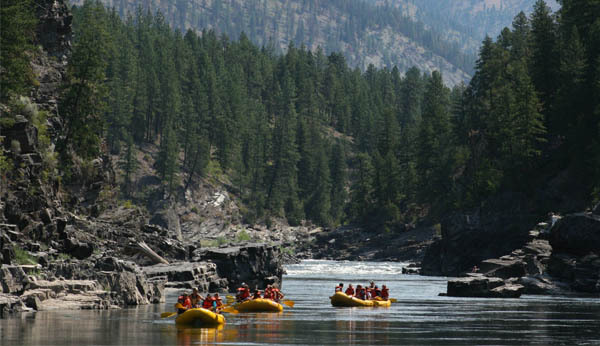 Our premier white water rafting runs on some of the finest rivers in Montana. The Tarkio Gorge is located just below the rapids of the Alberton Gorge. This section of the Clark Fork River offers scenic views of lofty cliffs and just a few exhilarating rapids to add to the fun. While relaxing on this picturesque float trip, you will be dipped in nature as this section of river offers outstanding opportunities for wildlife viewing and birdwatching. It is common to see whitetail and mule deer, osprey, kingfishers, and eagles. The Tarkio Gorge section is also home to elk, black bear, moose, and river otters. The Tarkio Gorge is a wise choice for those with young children or those looking for a gentle river experience. This float is dotted with sandy beaches, deep swimming holes, and scenic views, making it an excellent opportunity to take in all the extraordinary sights and sounds of the Missoula Valley and discover one of Western Montana’s well-hidden secrets. Known for legendary dry fly-fishing, the Blackfoot River was the inspiration for Norman Maclean’s book, A River Runs Through It. But you do not need to be Brad Pitt in order to float through a section of this stunning river comprised of clear water, ponderosa pines, spectacular views, and a chance to see all of the wildlife for which Western Montana is known. The Blackfoot River is perfect for a whitewater or scenic raft trip because it has so many different features at a variety of river levels. During the high-water months of May and June, the Blackfoot possesses big Class II and III white water. Later in the season, as the water level drops, the river becomes a class II technical (and teachable) paradise which commands accurate and particular maneuvering. Hellgate Canyon is a canyon in Missoula County, Montana, formed by the Clark Fork River. It is located just to the east of Missoula and the entrance to the canyon is known as Hell’s Gate. But, don’t be fooled by the name! The only thing scary about floating the Hellgate Canyon section of the Clark Fork River, is the amount of fun you will have. This half day river trip begins above Missoula, travels through Hellgate Canyon and ends in the heart of Missoula. You can expect to see breathtaking scenery and abundant wildlife. Elk, whitetail deer, mule deer, black bears, eagles, ospreys, hawks, and beaver call this part of the Clark Fork River home. Hellgate Canyon is the sire of ancient Blackfoot Indian raids on other tribes that had the misfortune of passing through the canyon while buffalo hunting. Floating down this stretch of river will bring you back to those times and encourage you to envision the battles and muse upon the secrets of the days of old. For the adventurous, try an inflatable or sit-on-top kayak tour. Discover the freedom and challenge of the river by paddling your own boat. Join 10,000 Waves for Missoula whitewater rafting and scenic float trips at their best. 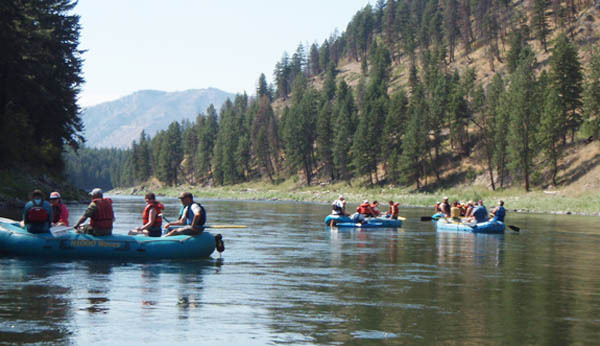 We offer a variety of the best Montana river rafting has to offer, from a half-day scenic float to a full day of whitewater rafting near Missoula. We specialize in beautiful scenic rafting trips on the Blackfoot River and white water adventures on the Alberton Gorge section of the Clark Fork River in the beautiful area of Missoula, Montana. Why Choose 10,000 Waves Raft & Kayak Adventures? 10,000 Waves has always been committed to providing high-quality river trips on Western Montana’s finest rivers. We have been running custom rafting and kayaking trips on the Blackfoot River and Alberton Gorge for over fifteen years. Our priority is to give you and your family and friends the best river experience possible.